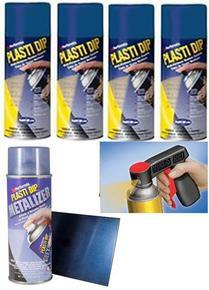 Plasti Dip 311 gram Aerosol x 4 Cans + 1 x Plasti Dip Blue Metalizer 311 gram Aerosol + Can Gun. Photo shows the Blue Metalizer over Black Plasti Dip. Different base colours will give different finished colours.